At the Top - Burj Khalifa, the modern architectural and engineering marvel to see the world from such a lofty height. By day and night At the Top provides unparalleled views of Dubai. A standard visit to At the Top lasts approximately 30 minutes, allowing ample time for you to relax and enjoy the Dubai skyline at your leisure. Experience the thrill of a lifetime as high-speed elevators whisk you 124 floors above the ground for an awe-inspiring view from the Burj Khalifa Observation Deck. No building in modern history has aroused so much curiosity and intrigue as has Burj Khalifa. Your At The Top, Burj Khalifa visit will answer all your questions. From your vantage point on level 124 of the world's tallest building, Your At The Top, Burj Khalifa visit begins in the reception area on the lower ground level of The Dubai Mall. Here and throughout your journey, you will be entertained and informed by a multi-media presentation that chronicles Dubai's exotic history and the fascinating story of Burj Khalifa. Special telescopes provide virtual time-travel visions of the scenes beyond and below. You'll see close-up real-time views as well as the past and the future, by day and by night. You can also walk the entire perimeter for the most comprehensive views. If you wish, adventure outside onto the open-air terrace to enjoy another perspective of the sweeping views below. A visit to At the top, Burj Khalifa is an unforgettable lifetime experience you don't want to miss out on if you're visiting Dubai. The average time it takes to enjoy At the Top is approximately 1 hour and 30 minutes however you are welcome to take your time. Please note that the average visit time may extend according during peak seasons and sunset times. Guests of At the Top, Burj Khalifa SKY can stay at level 148 for up to 30 minutes to continue the journey to level 125, where they can stay as long as they prefer. For visitors to level 124 who wish to view the sunset, we would recommend booking an entry time approximately 90 minutes prior. For your safety, the outdoor terrace may need to close during severe weather conditions. Refunds and rain checks are not offered for inclement weather. Visitors to At the Top, Burj Khalifa can rent the smart audio device with headphones to enjoy the fascinating story of the engineering and architectural marvel. The tours are also available in English, Arabic, French, Spanish, Mandarin, Japanese, Russian, and German. Young guests between 8-12 years of age, have an option of a special children's audio tour. Now available at an introductory price of AED 25, the Audio Guided Tour can be obtained from the ticket counter. 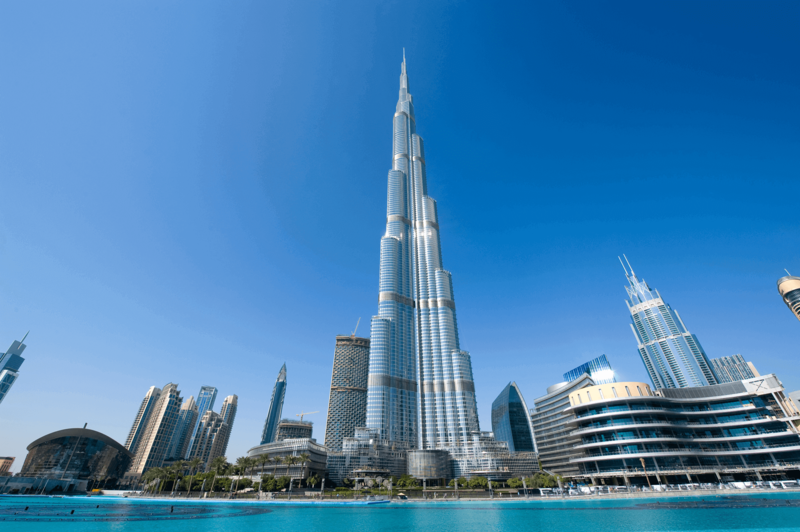 At the Top, Burj Khalifa SKY visitors can enjoy the guided tours by a Guest Ambassador. You can now stay connected with a dedicated Wi-Fi coverage available throughout the attraction, with our compliments. Dedicated photo kiosks allow our visitors to capture their memorable moments at At the Top, Burj Khalifa in a unique style. Using the green screen technology, our team of photographers create beautiful backdrops illustrating the Burj Khalifa external facade or striking views of the city. The photo kiosks also offer printing of pictures on a range of merchandise making an ideal At the Top, Burj Khalifa memorabilia. Head to the top of Dubai's highest building on the world's fastest elevator for panoramic views of the city. Take full advantage of the state of the art telescopes to view and learn about the landmarks below and browse the gift store for cool souvenirs. Children under 4 years of age is free of cost. You may show your voucher with the QR code on your mobile phone or print them out. You are required to carry a valid photo-ID to retrieve your tickets at the will-call window at Burj Khalifa. Tickets can be canceled up to 72 hours prior to your designated time slot. There are no refunds for hazy weather as it's difficult to guarantee weather conditions.